Taking a closer look at hog marketing contracts could benefit producers in this time of market uncertainty. With hog margins currently at some of the most depressed levels in years, many producers are understandably concerned with the price they are receiving for their pigs. While much of the present situation is beyond the producer’s control, such as tariffs and trade issues, there are other areas where they can exert more influence. Controlling costs is certainly one of those, and many operations have already made adjustments to become more efficient. Another area that may be one to look at is how they are paid by the packer for their pigs. Most producers deliver hogs off formula contracts, where the pricing mechanism is determined in advance and remains consistent over the life of the contract. These may include some differential from the CME Lean Hog Index, for example, or be a function of some cash price as reported by USDA such as a percentage of cutout or differential from Western Corn Belt. Fortunately, there is a way you can make these comparisons and analyze various contract alternatives to help inform decisions about how to negotiate with a new packer or renegotiate with your existing packer. As an example, you might compare two different offerings to see how they would have stacked up against each other in past years. In addition to providing a historical price comparison, this would also allow you to measure basis variance between the two in order to help gauge whether one contract may have been more favorable than another. We can look at a specific example comparing the difference between 90% of cutout for instance against the Western Corn Belt plus $5 to see how these two payment formulas would have differed historically over the past five years. Figure 1 shows the comparison of these two price series over the past year. You will notice that the contract based off 90% of cutout is currently higher than the WCB plus $5 contract by $2.02 per hundredweight ($69.27 versus $67.25). As a result, it would be more favorable to deliver pigs in the spot market against the contract priced off of the cutout rather than the WCB contract. 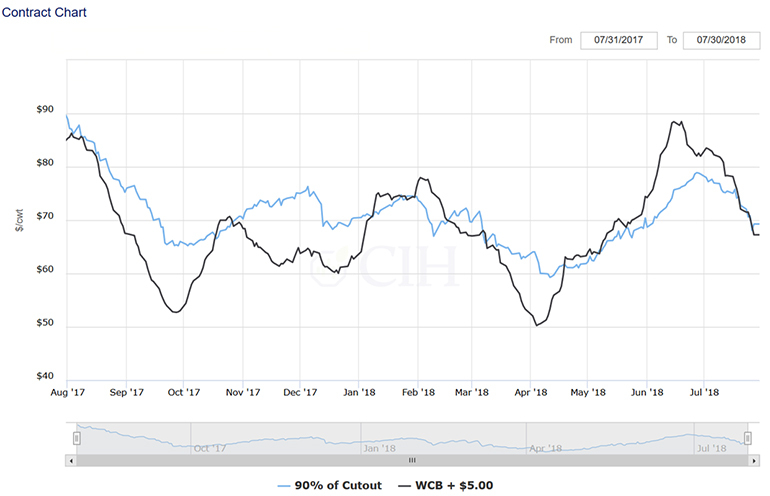 You may also notice though in the comparison of the two price series that up until quite recently, it was actually much more favorable to be priced off of the WCB contract compared to the cutout formula, in some cases by almost $13 per hundredweight. There were other times however, such as earlier this spring and particularly last fall, when it was significantly better to have been priced off the cutout contract relative to the WCB formula. In addition, you can see that there has been more variance in the past year with the WCB contract price series than the cutout contract series. While both were priced very closely together at around $88 last summer, the lows in the WCB plus $5 series show much deeper troughs while conversely, the recent high has also been much more of a premium as compared to the 90% of cutout series. We can also look at the historical variance of the two price series by comparing both price and basis in the following table of Figure 2. This comparison measures current values against averages over the past one, three and five years of history. Here again, we can see that being priced off 90% of cutout is currently more favorable than having a contract based on WCB plus $5, with both the one- and three-year averages showing the cutout contract to likewise be superior. However, a longer-term view taking a five-year average shows the price of WCB plus $5 to be slightly higher by about $0.60 per hundredweight. These comparisons can also be shown visually in graphs with some interesting observations. 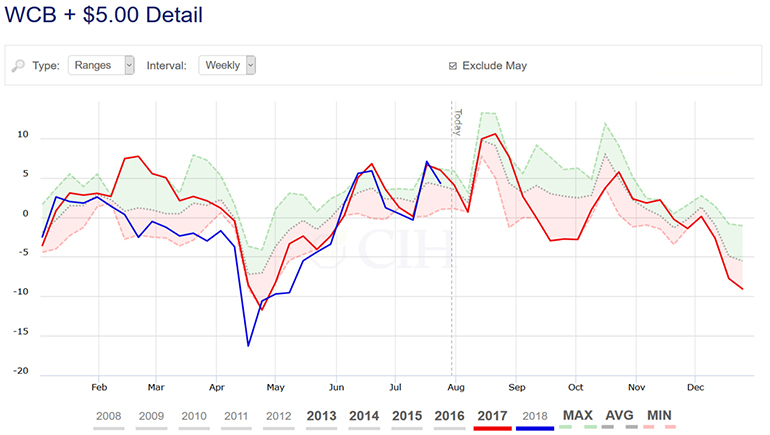 Note that the previous chart comparing the past year of price performance indicates more variance in the WCB price series versus that of the cutout series. While this has been true over the past year, the basis history reveals something different. Figures 3 and 4 show the five-year basis ranges for both the WCB plus $5 versus 90% of cutout, respectively. 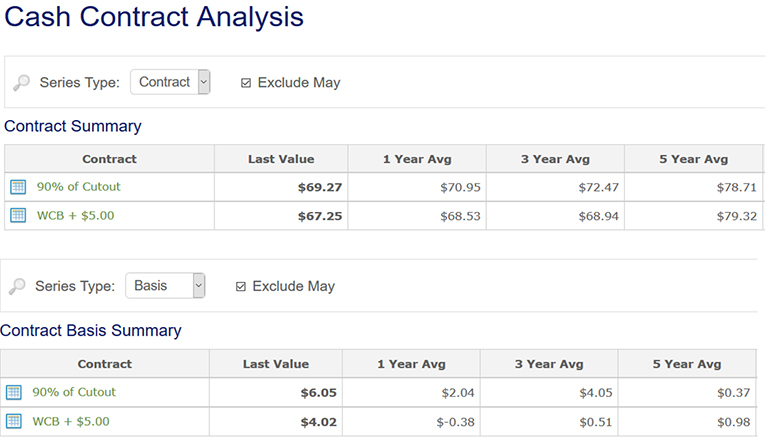 In both cases, the CME May Lean Hog futures contract has been excluded from the basis calculations. 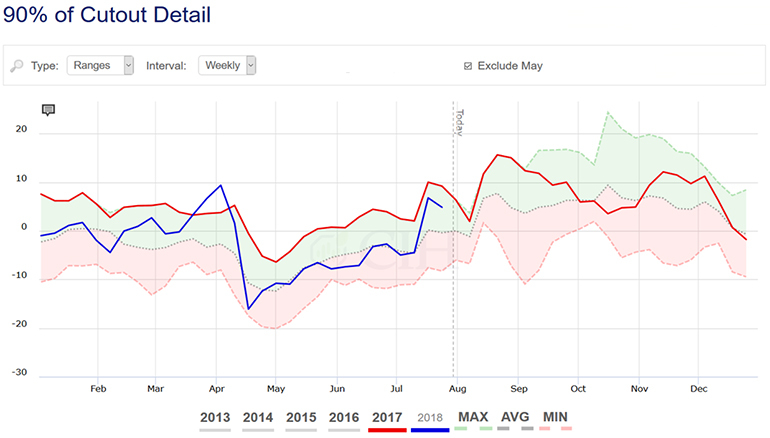 You will notice that the range of basis for the WCB plus $5 price series has been $29.51 per hundredweight over the past five years, with a maximum value of $13.22 per hundredweight positive to $16.29 per hundredweight negative. Conversely, the range of basis for the 90% of cutout series has been wider at $44.52 per hundredweight during the same time interval, with a maximum value of $24.41 per hundredweight positive to $20.11 per hundredweight negative. It may be misleading therefore to conclude that you would be assuming more risk with the contract based off the WCB plus $5, despite the relative price performance of each during the past year. For more information on how these studies were created or for help understanding how to navigate packer contracts, feel free to contact us directly. While much of the current hog margin landscape is beyond producer control, there are things that producers have more say over. The ability to better understand and negotiate packer contract offerings is definitely something a producer can leverage to help increase revenue and mitigate losses in the present environment, and there are tools to help them in this process.